Charlotte, North Carolina resident and awesome 3-year-old Grayson Clamp up until recently lacked the ability to hear, thanks to missing hearing nerves in both of his ears. Recently, in conjunction with the University of North Carolina, Grayson was given the opportunity to hear for the first time by doctors who performed an auditory brain stem implant as part of an investigational trial. 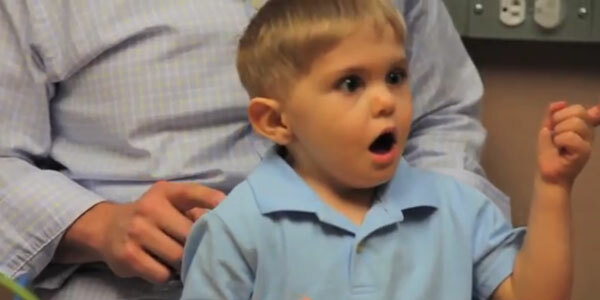 Clamp is the only child in the United States to have ever undergone the procedure, but seeing his face when he hears his father for the first time just makes us hope more kids receive the opportunity to undergo the procedure. The above video describes the procedure that little Grayson went through, as well as explains the specifics of the hearing disability the little boy has that made him a prime candidate for the operation. If you go to around the 2 minute and 16 second mark, however, the real magic begins to happen. Grayson’s father, Len Clamp, was astounded by the look on his little boy's face when he began to hear sounds for the first time. In the video, Len is overcome with emotion as Grayson begins to hear, and begins repeating the words “Daddy loves you. Daddy loves you,” to which Grayson reacts with shock and surprise, and luckily no alarm. The father and son moment is touching, and it’s certainly a poster moment for UNC medicine and the possibility that other youngsters will eventually be allowed to undergo the procedure in other United States. When Grayson was born, his parents wanted to do anything in their power to help him to hear. They initially looked into the more common cochlear implants that have helped many people, including a recent young woman named Amy, who was also astounded to be able to hear for the first time. Unfortunately, Grayson’s lack of hearing nerves would not allow a cochlear implant to be effective. Instead, his family sought out other potential options for the youngster. Eventually, the Clamps hooked up with UNC, which had earned the right from the Food and Drug Administration to administer an auditory brain stem implant trial on children. According to UNC Medicine, the surgery was performed by Craig Buchman, MD, Professor of Otolaryngology and Head and Neck Surgery, and Matthew Ewend, MD, the Chair in the Department of Neurosurgery. With the outcome of Grayson's procedure ending on a high note, the procedure is now being considered for other deaf children that can’t be helped by cochlear implants. The world of medicine is not always full of light and joy, but sometimes being given the opportunity to help patients like little Grayson, makes the day to day drudgery all the more worthwhile.